Samsung Galaxy Ace 3 S7270 is its charging problem, and this is mainly because if your charging connector is giving you problems then sooner or later your phone is going to be out of charge hence rendering you completely helpless, therefore it is highly recommended that one should get it fixed as soon as one notices any such charging issues. S7270 is not charging at all. Samsung S7270 heats up during charging. Check charging voltage with the help of multi meter. Place Negative terminal of multi meter on ground and Positive on a charging pin (1st pin from your left hand side). Make sure that the voltage is between 5V to 5.5V, if it is not then replace charging connector. (Charging Connector can be replaced by heating it from the opposite side of the board, while heating it, pull charging connector with the help of Tweezers). Check continuity between Fuse and Charging Pin (1st from your left hand side). If there is no continuity, place jumper. 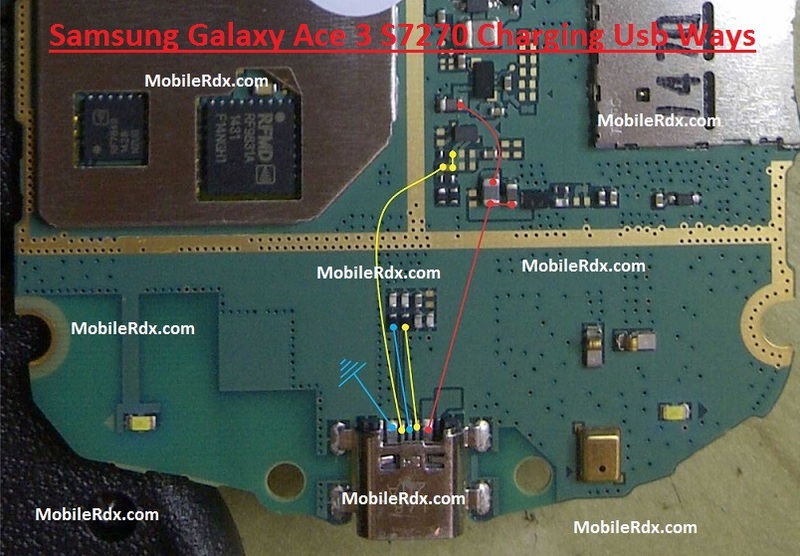 Samsung Galaxy Ace 3 S7270 Charging Solution,Usb Problem,Charging Ways,Usb Problem Jumper,Samsung GT- S7270 Not Charging Problem,Charge Ways,Usb Not Recognized,Repair Charging Usb Problem.